It’s been a good long while since I had a sandwich as good as Annie’s on Congress[ Al John’s era 1976-2009]. Washed down with an ice cold Harpoon IPA it made as fine a lunch as I’ve had in recent memory. Annie’s is a confusing scene. Walking in I wasn’t sure how to dine. There’s a sign telling you to walk this way if you want lunch or walk that way if you want lunch. We chose to walk that way when we saw the bar [gorgeous], seated ourselves and checked in with the bartender who was right happy to see us. I’ve heard nothing but good things about the quality of the cocktails so while my companion excused herself I ordered a couple Dark and Stormys. If I ever walk into a bar in Austin that trumpets its’ “pre-prohibition”cocktails that can make me a Dark and Stormy I’m dropping a crisp c-note straight in the tip jar. In other words; I don’t see it happening. It’s one thing to talk up your cocktail game and it’s another thing to be able to make one of the most basic , if not storied cocktails of the last 80 years. We order a couple sandwiches and I decide to take a quick tour of the facility and see what Annie offers. There’s a deli case in the back with a variety of salads and soups for busy office drones who need to grab their chow and run. A nice basket filled with a variety of Zapp’s chips and a drink case with Topo Chico round out the back of the room. I request a Caesar salad and make my way back to the bar. It’s a straight take on the classic , lightly dressed, adorned with good croutons [Annie’s produces much of its’ own bread] and Parmigiano, it’s not the best I’ve had in town but it eats just fine. 10 or so minutes passes and our sandwiches arrive. 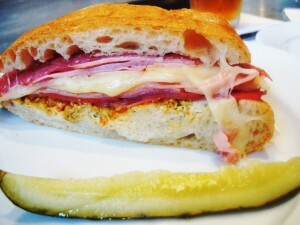 Outside of Baguette House and Tam Deli this is the finest sandwich in Austin. At first blush I thought there is simply no way this little thing will feed me but it actually has a good heft to it. The highlights:Good quality deli meats. To wit: Plenty salami, cappicola and ham drenched in molten Swiss. They could’ve veered down the too rich path with this but they right the ship by slathering on a housemade tapenade that gives you a nice vinegary counterpunch. The bread is incredible. Clearly homemade with a good crust and a nice crumb. It made me want to drive over to Hog Island and dropkick somebody [ not the baker since they get their rolls off a freezer truck ]. Mid-feed we realize we’re in need of some fried potatoes. I inquire as to whether they’re housemade and upon getting the affirmative we slow down the eating so as to enjoy the symphony that a sandwich and fries provides. The fries are delivered forthwith and they are right near perfect . Shoe string cut and double dipped,the only thing they needed was a shower of salt while they were still shiny from the fryer and they would’ve been near the top of the austin fry chain. Service is solid . I always sit at the bar if at all possible . Bartenders have a greater tendency to be pros at the game than servers and the man on duty is skilled . He doesn’t hover but he’s got the whole corner of the eye thing going . He’s a cool young cat who knows how to pour a nice draft, keeps the water glasses filled and is congenial. I’m excited to return to Annies. I know the reviews have been mixed but ten dollars for a top notch hot sandwich and a cold pint of IPA is hard to beat given the downtown location. Maybe I’ll bring a bottle of Fentiman’s and see if their cocktails are on point.